Toni Yates has the latest on a Paramus pet store owner under fire after dozens of puppies were found in a van outside the store. PARAMUS, New Jersey (WABC) -- Protesters gathered Wednesday outside a New Jersey pet store where dozens of puppies and small dogs were found crammed in a van behind the store. Animal lovers are upset after the owner of Just Pups on Route 17 was accused of keeping injured puppies in the van, but the owner claims the puppies were hurt when the van was towed. Owner Vincent LoSacco opened his Paramus store to us Wednesday, showing the wall of cages and pens filled with puppies, sharing his side of the story. After Paramus police and the SPCA confiscated 67 puppies found in cages, they say, in unsanitary and cold conditions in a van behind the store Sunday night, it began an animal cruelty investigation. LoSacco says nothing there was against the law. "It's the conditions you leave them in. As long as they have food, water..these are similar to the cages in the store," he said. Some local students protested outside the store after hearing about the animals. "This is our community and animal cruelty is still happening, and it's disgusting," said animal rights activist Ashley Dondershine. And pet owners who say they bought their dogs from Just Pups also showed up. One dog, Bruno, was purchased four years ago. "He was very ill, wound up staying at the vet overnight twice, $3,000 dollars worth of vet bills," said pet owner Trish Derderian. Johnny McCarthy says his dog Maggie was sick, but the store owner: "He was doing everything he could to keep the dog healthy," he said. He also heard about the van of dogs. "I don't know if that's the best situation but if it's not against the law, who am I to say, I can feel bad," said McCarthy. ("Do you? ", we asked) "Yes. I would never do that to my dog," he said. Animal control has the dogs. Four were quarantined. LoSacco's Just Pups Middlesex County location was shut down and his license revoked after 267 violations. He also has an Emerson location. The mayor there sent his health officer to inspect it, in light of the other allegations. "He's been out 7 times since February 10th with SPCA inspectors, there were violations that were corrected," said Emerson Mayor Lous Lamatina. LoSacco insists his pets are cared for and he runs his business properly. "People say it's heartless, it's a lack of understanding..nothing bad or inhumane about it, but not knowing the industry I can see where someone would form that opinion," he said. The Bergen County Prosecutor's Office continues to investigate the incident and no charges have been filed. Two Paramus police officers found the dogs after they heard crying from inside the vehicle. The officers found several small crates, each with two to four puppies and small dogs inside. 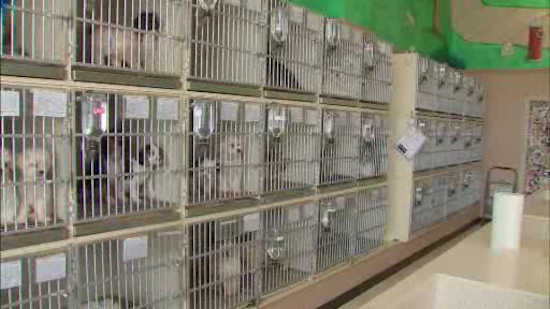 Investigators say the crates were too small for some of the dogs to stand up. Police chief Kenneth Ehrenberg says they contained no food or water and some of the dogs were covered in feces. It was 35 degrees inside and a space heater was not working. "They were in a customized van that was fully insulated and fully heated," said LoSacco. "The temperature wasn't taken until the door was opened for who knows how long," he added. "The police report bears out that they looked in the van. The van has no windows. To see the puppies in the van, you have to expose all the puppies. You have to open that sliding door and let all the cold air rush in and let all the hot air run out."